Cubs fans have an opportunity to see recent call-up Brett Jackson this weekend. AJ Pierzynski celebrates in the Sox dugout after hitting a home run. The dog days of summer don’t have to be all bad. This weekend is a sports fanatic&apos;s heaven. Once or twice a year the Major League Baseball schedule has both the Cubs and White Sox home at the same time. If you want to try it, you can see two games in person the same day. 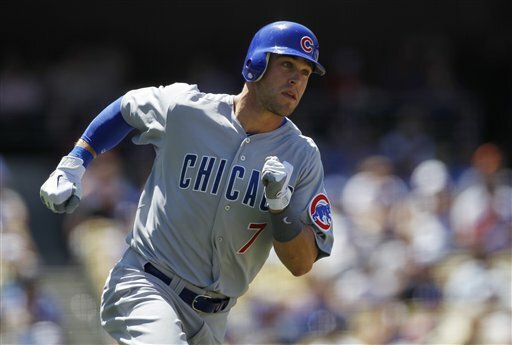 Friday afternoon the Cubs host the Cincinnati Reds at 1:20 at Wrigley. True, the Cubs are having a bad season and they traded away several key veterans; but now you have the opportunity to look at the future. First baseman Anthony Rizzo, second baseman Darwin Barney and shortstop Starlin Castro have already made good impressions on the field in a short time. Now with the elevation from the minors of Brett Jackson and Josh Vitters, could they be part of future plans for the Cubs President Theo Epstein and General Manager Jed Hoyer? Jackson will get plenty of playing time in centerfield and Vitters will have to prove that he can defensively play third if he is to stay with the parent club. After the Cubs play Dusty Baker&apos;s Reds, you can hop on the “L” and head down to U.S. Cellular Field and watch the playoff contending White Sox host the Oakland A&apos;s. The Sox are in the race for the post-season — it doesn&apos;t get any better than that (unless they win it all). You may even have an opportunity to see a long ball by Adam Dunn, Paul Konerko, Alex Rios, A.J. Pierzynski, Dayan Vicedo or Kevin Youkilis. Actually, anyone on this team is capable of providing fireworks. And speaking of fireworks, you can stick around and see the sky light up after the Sox finish their game. On Saturday, both teams play again at home. It&apos;s a tighter squeeze if you try to do both, as the Cubs and Reds square of at 3 p.m. and the Sox and A&apos;s start at 6 p.m. Forget about a double-header on Sunday — a diehard Cubs fan will be at Wrigley at 1:20 and a diehard Sox fan will be at U.S. Cellular at 1 p.m.
Of course, if baseball is not your thing, there&apos;s always Bears camp down at Bourbonnais. This is the final week of camp down at Olivet Nazarene. When they break camp on Friday, the remaining practices will be open only to the media until the regular season starts (that is when the door closes on us). Lastly, this is the final weekend of the Olympic Summer Games in London. If you&apos;re not yet fatigued from watching so much coverage you may want to be glued to your TV or computer. The wind-up is great to see the final games for the gold medal with the various team sports, volleyball, basketball, soccer, water polo, handball and the last event is the men&apos;s marathon. Finally, the closing ceremonies will complete the Olympics. The flames will be extinguished and it will be a tad sad for me (and I know not everyone agrees with me). I really wanted to see Chicago host the games in 2016. I know it wasn’t going to be easy, but it is really a once-in-a-lifetime opportunity to show the world what a great city we have here. Now I just have to figure where I will be this weekend.